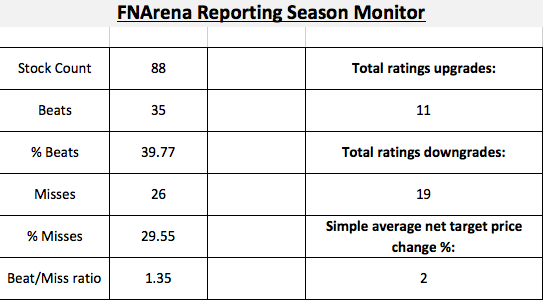 The FNArena Reporting Season Monitor takes the form of a spreadsheet that contains ratings and consensus price target changes along with brief summaries of the collective responses from FNArena database brokers for each individual stock. Readers are reminded that it matters not what profit/loss result is posted by each company, but by how much that result exceeded/fell short of stock analysts’ consensus forecasts. Livewire readers can access the latest update providing coverage of 88 stocks.